Connect FireWire Devices to a FireWire-Enabled Computer - 6 ft.
Get the lightning-fast data transfer rates you need for multimedia and other high-end applications! 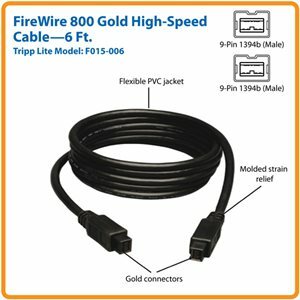 Tripp Lite's F015-006 Bilingual FireWire® Cable lets you take advantage of the latest FireWire technology by connecting Firewire 800 devices to 1394b ports. It's ideal for use with storage systems, digital camcorders, printers, scanners, and other FireWire-enabled devices. Premium double shielding and gold-plated connectors insure that you get the speed you expect from FireWire. And we back our pledge of quality with a lifetime product warranty. The F015-006 is a bilingual FireWire cable. It features two 9-pin male connectors that enable you to connect a 9-pin FireWire (1394b) device to a 9-pin FireWire 800 (1394b) port on a computer, providing data transfer rates of up to 800 Mbps—twice the speed of original FireWire technology. This premium Tripp Lite cable provides true plug-and-play convenience with no complicated setup procedures required. The F015-006 meets all FireWire 800 and 1394b specifications, is backward compatible with original FireWire systems and devices, and is fully compatible with PC, Mac, SUN, Apple FireWire, Sony iLink, and all other IEEE-1394b peripherals. The F015-006 is manufactured using top-quality materials. The cable features premium double shielding—both tinned copper braid and aluminum foil—to reduce EMI/RFI interference and virtually eliminate crosstalk. The durable molded connectors are gold-plated for superior conductivity and efficient data transmission. When you choose this genuine Tripp Lite cable, you get superior performance plus peace of mind! We're so confident of the quality of the F015-006 that we warrant it to be free from defects in material and workmanship—for life!